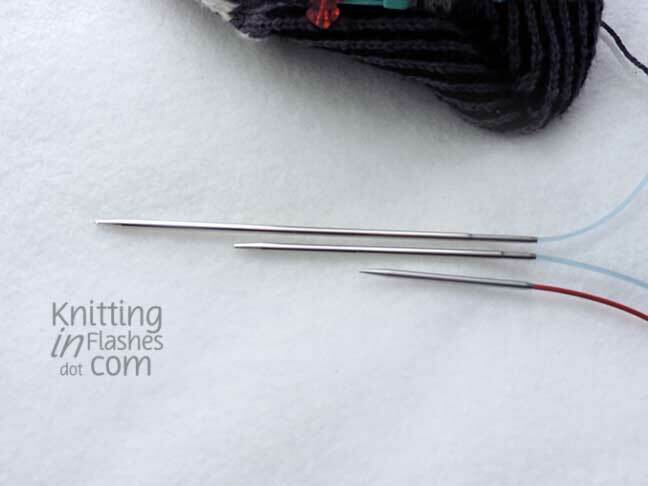 I think I confused many readers with my poor description of too long circular knitting needles in my previous post so this is my attempt to offer an explanation. Socks, hats, and mittens are basically tubes. 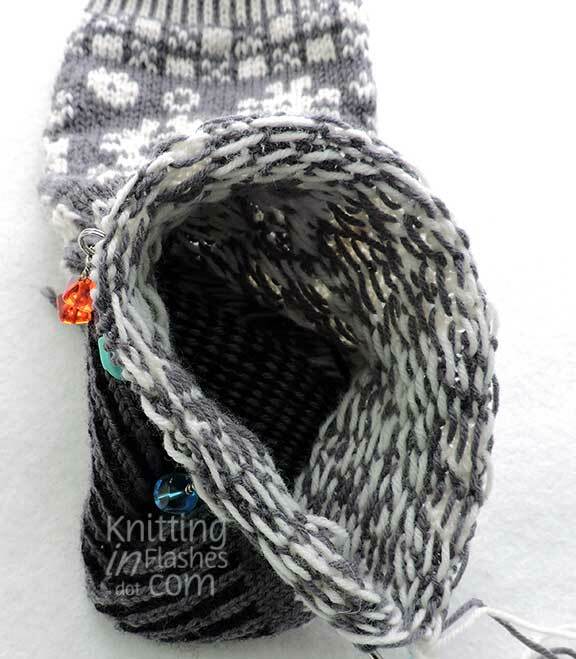 And if you don’t want seams in those items, you knit in-the-round and make a tube. Some knitters use double-point needles to create this tube and others use circular needles. Double-point needles (dpns) are pointed on each end. 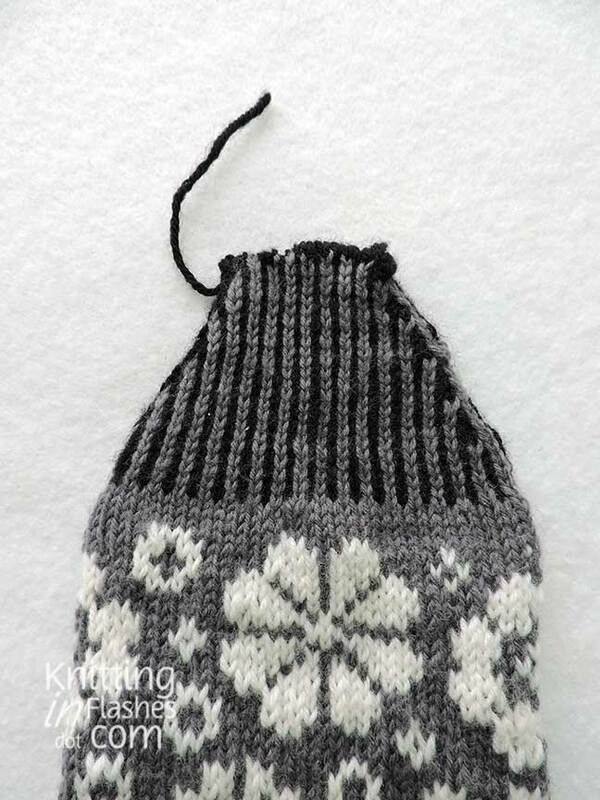 This allows the knitter to work across one needle, continue to the next needle, and so on in a circle (or spiral). Circular needles are two needle tips connected by a cable. Sometimes the cable is fixed and sometimes it unscrews from the needle tip to change the cable to another length. 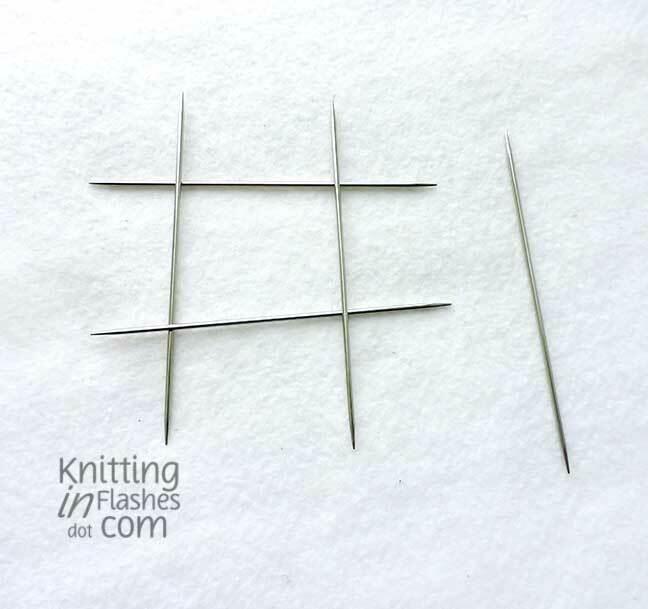 There are many videos on the interwebs that will give a better description using both types of needles but I just wanted to show why I went from using dpn to two circular needles and then to a tiny circular needle. 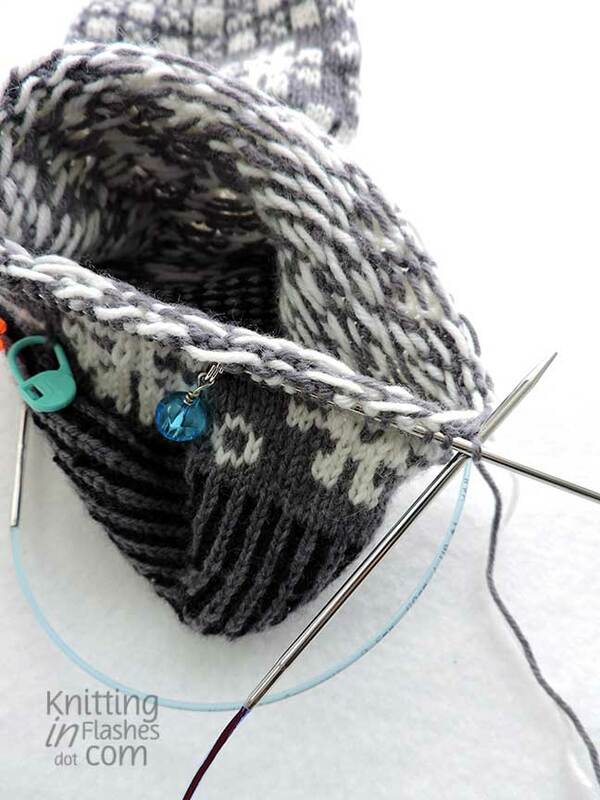 When using dpn and working from one needle to the next, a gap may appear at that join aka a ladder. Or the yarn is pulled so tight that it puckers. 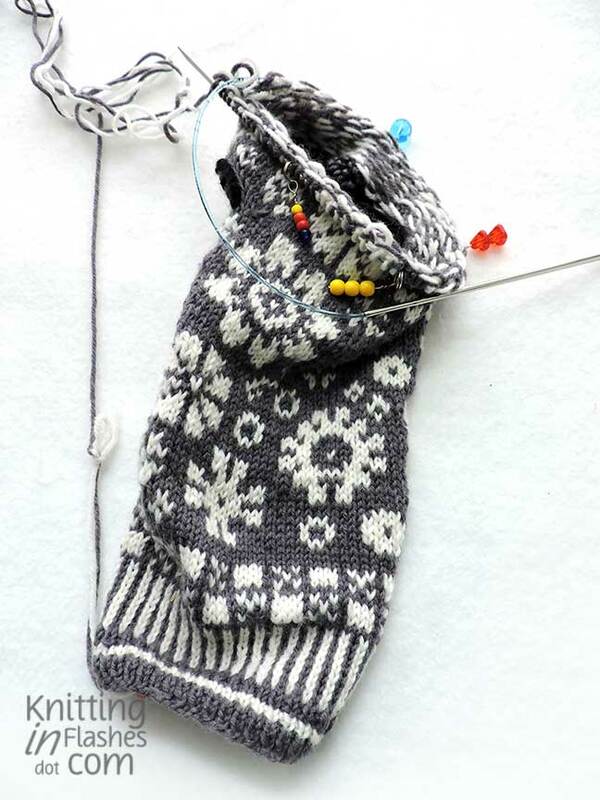 With circular needles, the piece is knit around and around so there is no definite join at the beginning or end of a needle. You can see the puckered area where I worked from one needle to the next and inadvertently pulled the yarn tighter across the back. This is a common problem when doing colorwork. The yarn that is not worked is carried loosely across the back to keep the tension even on the front. 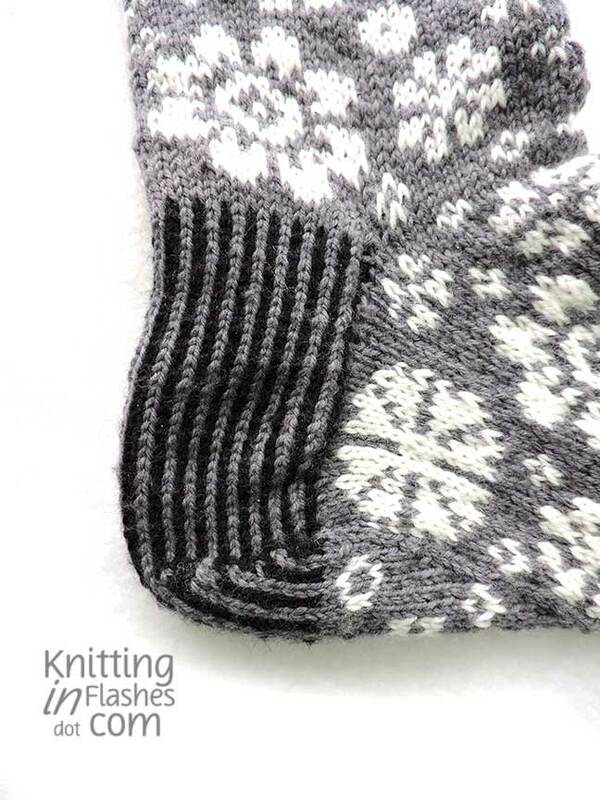 When using dpns, the chance of pulling the yarn tighter at the “corners” is greater than on a straight section. 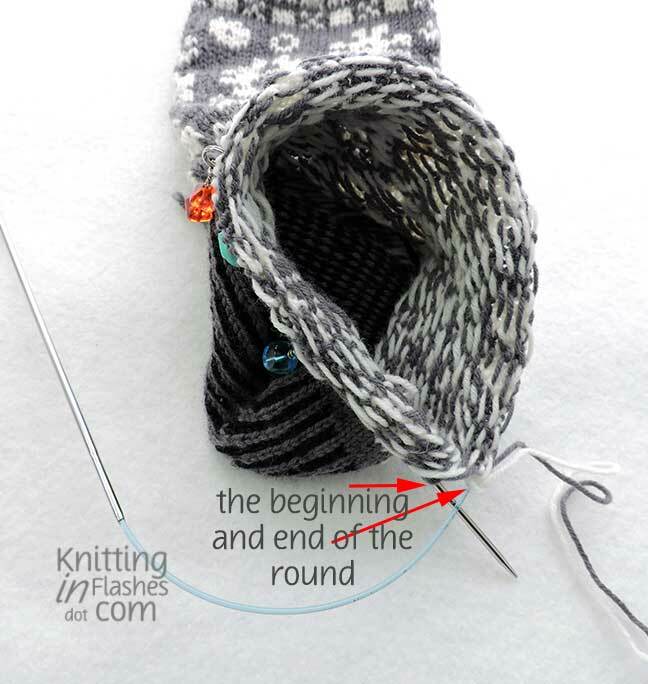 Here is the inside of the sock that shows how the unused yarn floats across the worked stitches until it’s needed again. I had two cable needles, one 16 inches long and the other 24 inches long. Both were clearly too long to knit comfortably. 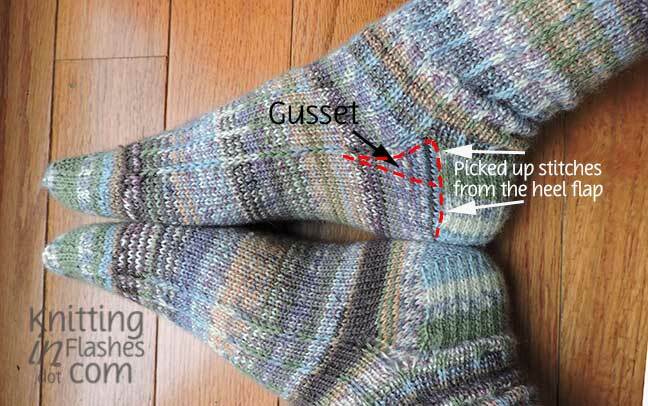 The average foot circumference is less than 16 inches around and the sock would be stretched out of shape. Mine is approximately 8.5 inches around the ball of my foot. Even when working with one, then switching to the next, it was not comfortable. Part of that was due to the length of the actual needle tip. All of the needles below are US #1.5 (2.5 mm) but the tips (and cables) are different lengths. 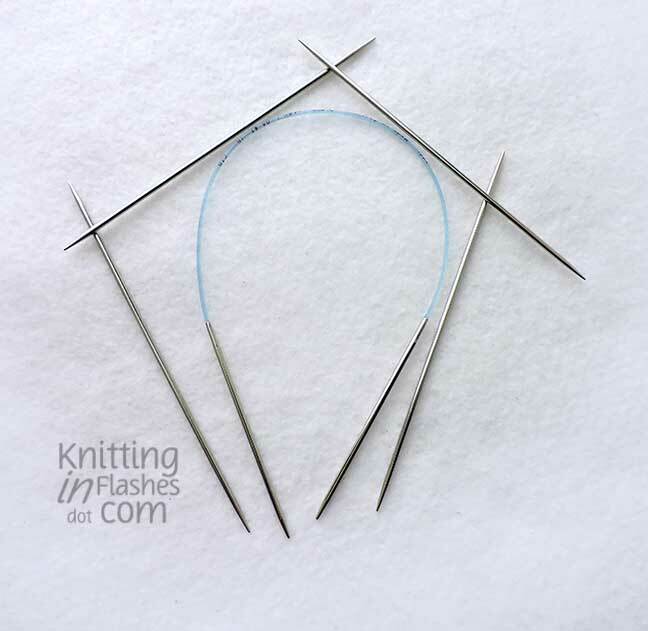 The top needle tip is 5-inches long, the middle 3 3/8-inches, and the bottom 2-inches. As you could imagine, working around a 9-inch circle with a 5-inch straight needle would be difficult and uncomfortable. 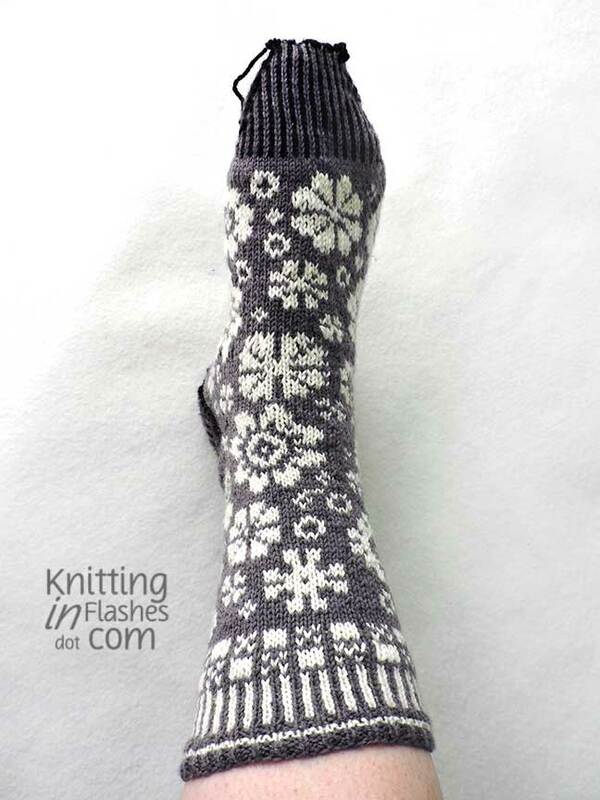 Obviously, it can be done but I knit for pleasure and this was so not pleasurable. 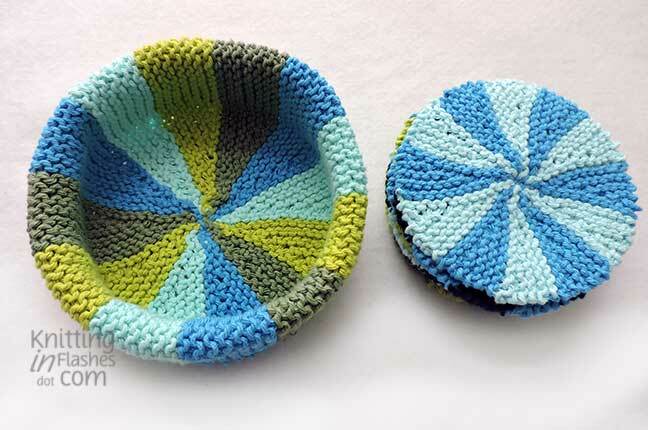 I splurged and bought two 9-inch length circular needles. One US #1 and one US #1.5. What a difference this has made! The stitches are on the tiny red cable and only the points show through the ends. The sock isn’t stretched out at all. No more puckers. 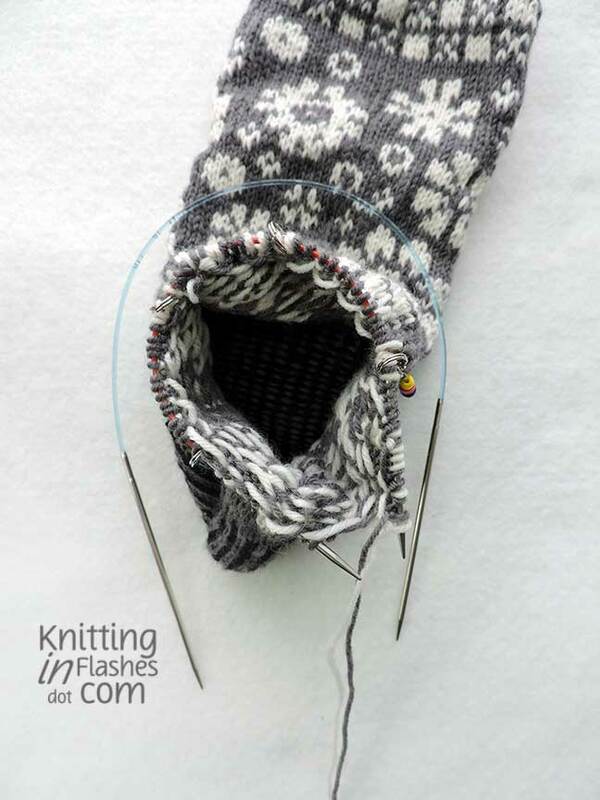 No more fiddling with five double-point needles. It was a bit of a learning curve to hold a 2-inch needle, however, not bad at all. 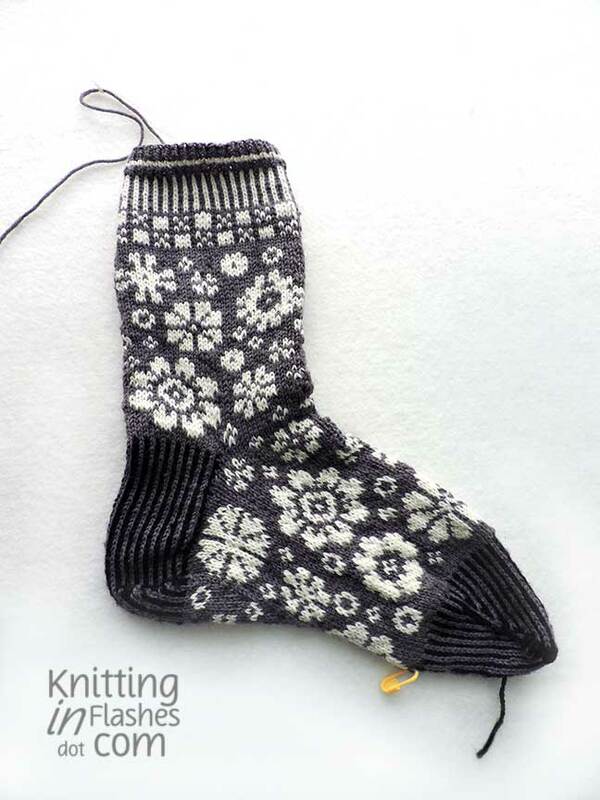 I will have to go back to the dpns once I get to the toe but I’m looking forward to making the second sock and many, many more. I’m a believer. I don’t know how I got sucked down the Ravelry hole but it doesn’t really matter. If you’ve ever searched for something, you can understand how one thing leads to another to another and so on and so on. 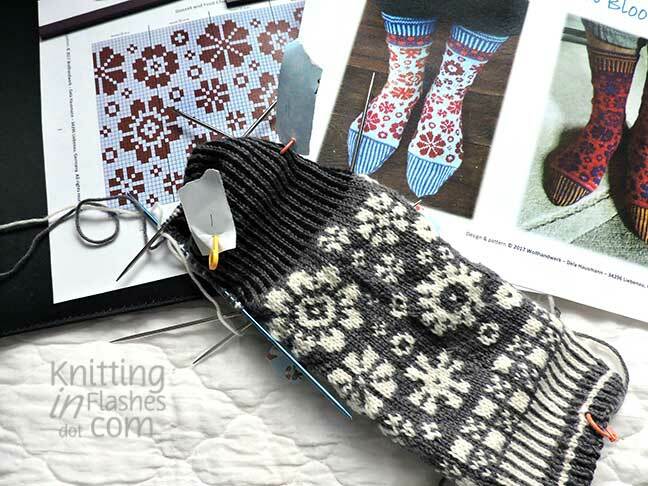 I resurfaced with a project: Latvian Bloom Socks by Dela Hausmann. 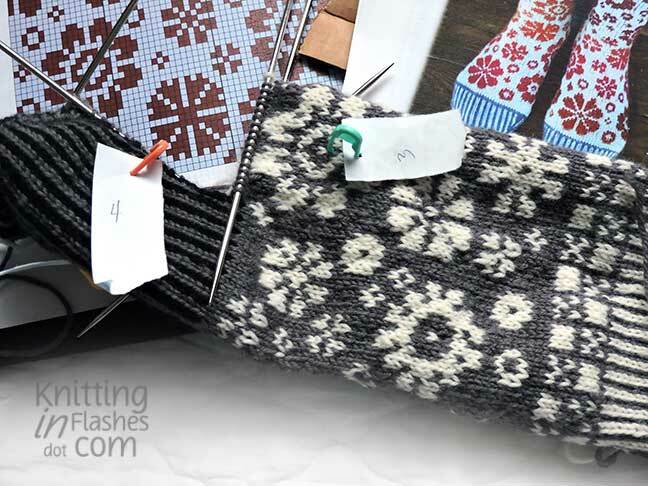 The graph for the colorwork is marked in four sections which would correspond to four double-point needles (dpn) containing 18 stitches each. See my little paper tags attached to the sock section?? 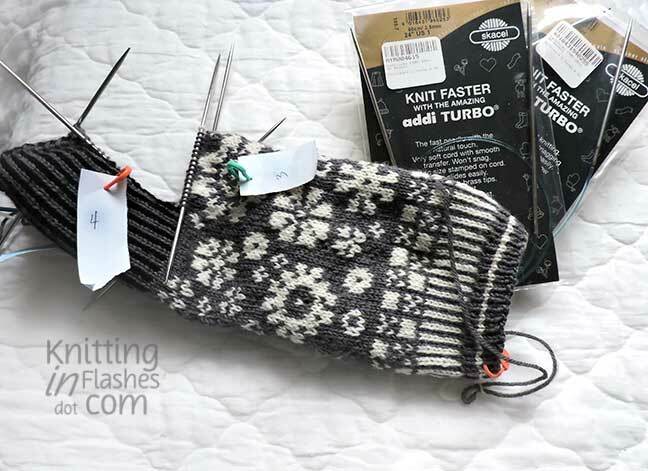 Using Knit Picks Stroll in Ash, Black and Bare, I’m already into the foot section. 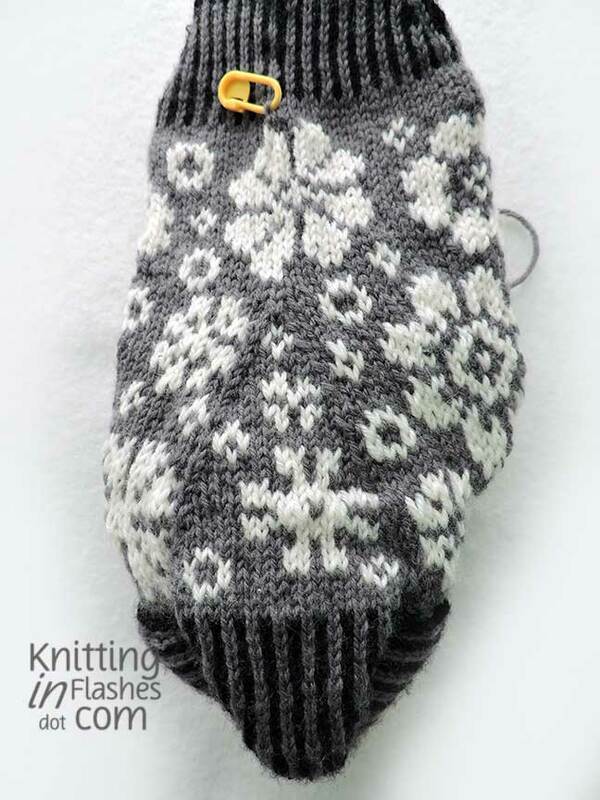 I prefer to knit with dpn but notice that my colorwork stitches pucker a bit when I switch from dpn to the next. 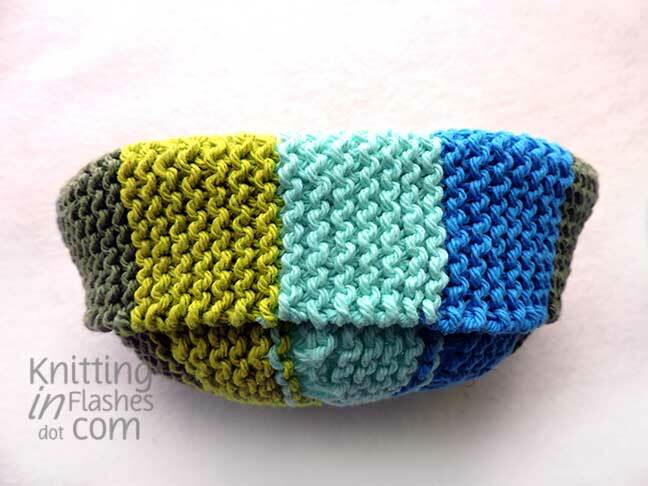 I try to keep the yarn that is carried across the back as loose as possible without going overboard. I even knit inside out but I like to look at my progress and I didn’t want to fiddle with turning it right side out and back again. It’s too easy to lose stitches that way. It’s slow going. I tried Magic Loop but my 24″ circular needle isn’t really long enough for that technique and the 16″ is too long for the circumference of the sock. 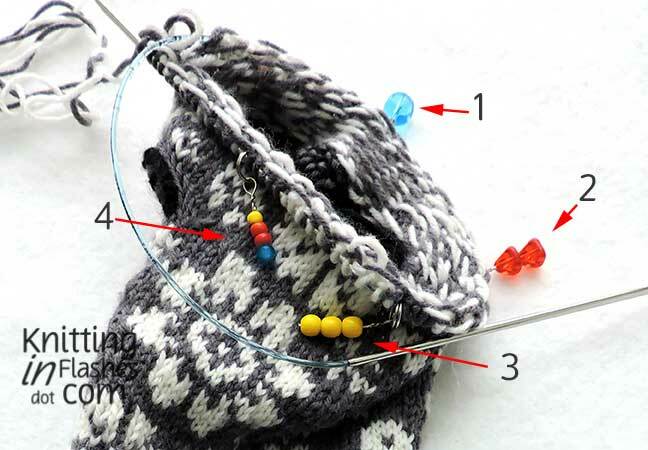 So I tried to use both needles by knitting a round on one then when back at the beginning of that round, I use the second needle to knit the next round to make a sort of flexible needle. 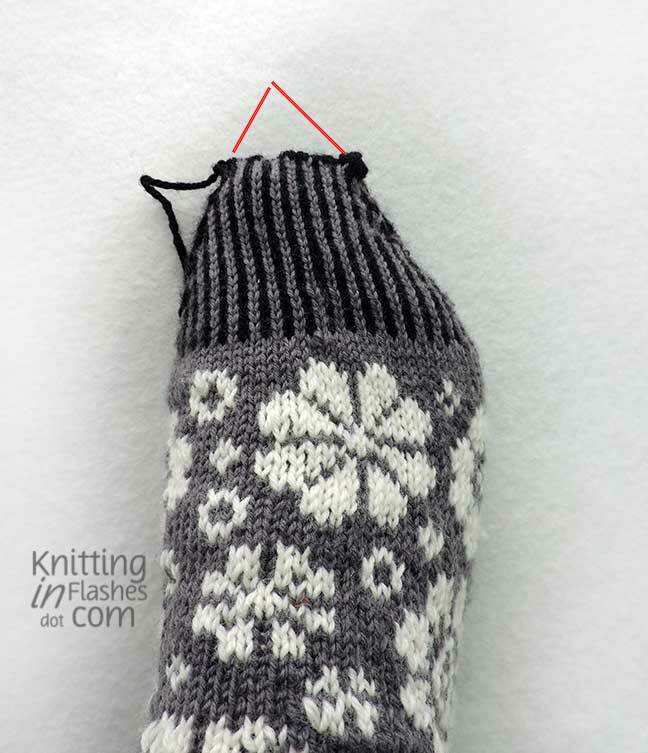 Unfortunately, the straight part of the 24″ needle is too long to keep the sock in a comfortable circle. I’m not sure if I’ve explained that correctly. Trust me, it’s not relaxing. 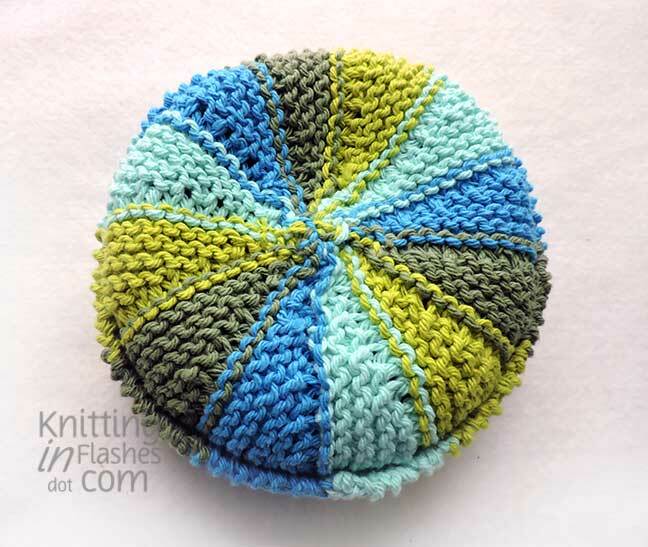 Since switching to circular needles, I still needed to follow the graph which is laid out by needle (1, 2, 3, and 4). I made some stitch markers to remind me what needle I’m working with: one bead for needle #1, 2 beads for needle #2, 3 beads for needle #3, and 4 beads for needle #4. This little trick works for me. Anyway, I ordered some 9-inch US #1 (2.25 mm) and US #1.5 (2.50 mm) circular needles. They should arrive today. I’ll let you know how this all works out. While the Double Dot socks were hibernating waiting for me to address the twisted stitches, I whipped up a corral for all those coasters I couldn’t stop knitting last year. 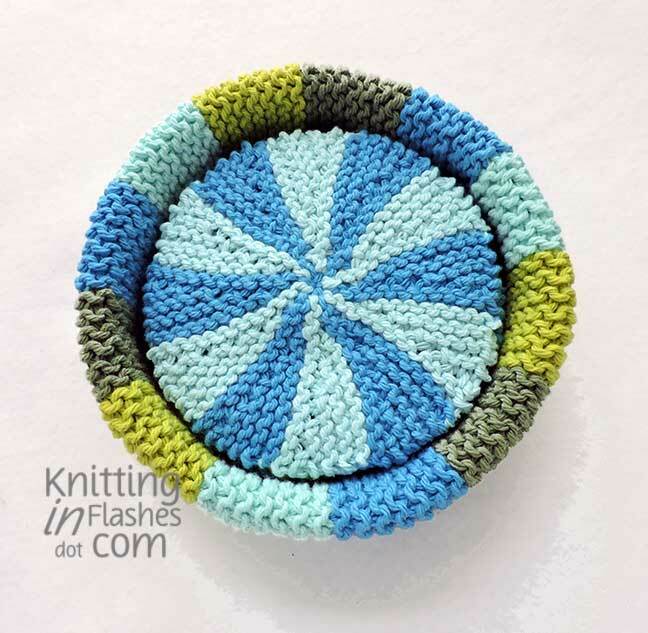 I combined the coaster pattern and the Drops Farmer’s Delight basket patterns to coordinate with the two-tone coasters. A provisional cast-on hides the seam. I used four of the colors from the coasters for the corral, two blue shades, and two green. The corral looks like a hat with a very deep brim that is folded down to cover the “wrong” side. The bottom or wrong side doesn’t look that nice but it’s not seen even when empty. 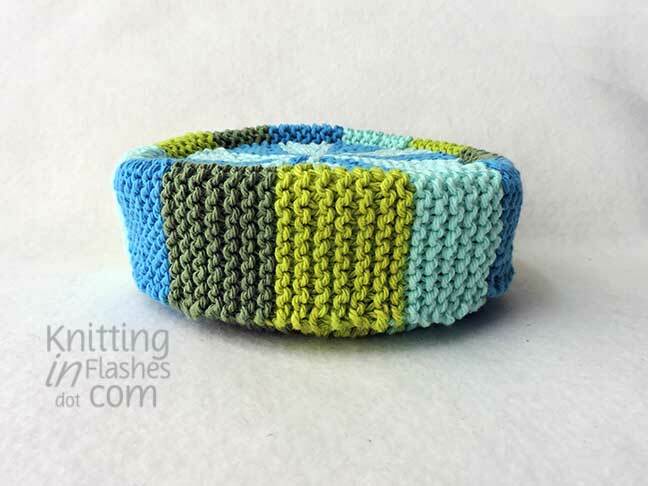 This one holds approximately eight coasters and could be made it taller by adding more stitches for the sides/brim.